1 Bedroom Cabin In The Country! 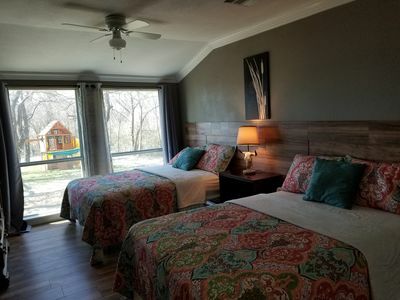 Our fully-furnished 1 bdrm cabin nestled among the trees on our private 50 acre ranch is situated directly on a large fishing pond and a great place for individuals, couples and small families to get away from the city noise and relax! Enjoy taking the boat out for a serene journey, fishing without a license, horseback riding, the 2 outdoor fire-pits, charcoal grill, porch swing and children's swings & play-set all on the same property! 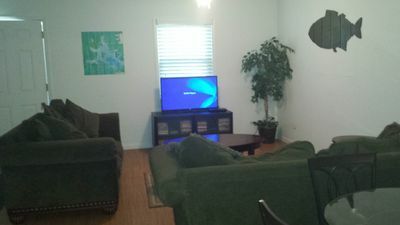 There is a king-sized bed in the bedroom and 2 twin air mattresses, pump and bedding available. In the bathroom there are 2 sinks, a walk-in shower and a garden-sized bathtub! 1. John Clayton with CHU Stables offers basic riding lessons for a very reasonable price of $35 per 45 minute lesson. Lessons should be arranged upon or before arrival. 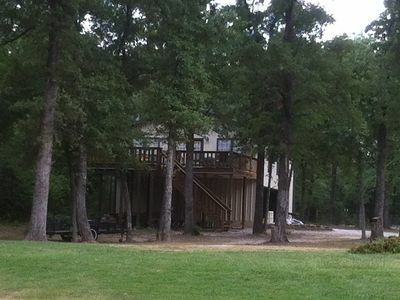 We also have a 2 acre stocked fishing pond literally off the cabin's back porch. Catfish, crappie, small and large mouth bass! Beginner and bamboo fishing poles and a few pieces of tackle are available in the cabin, but if you are planning to fish, you will probably want to bring your own equipment! Fishing is catch & release unless agreed with the property manager. We have 1 non-motorized boat options (and life jackets) for guests to enjoy the pond. It is a large, yellow 10ft 3 person sit-on-top Kayak by Lifetime with 2 Paddles. Right by the cabin is a large swing set (that even adults can use!) and a play-set for children. You are completely secluded away from the city. There are a few local restaurants around, and 3 within walking distance if you're up for a trek. It is quiet and peaceful except for the occasional horse gallop, sheep bleat, rooster crow or donkey call! The closest grocery store is about 10 minutes away by car in Royse City (Walmart) or in Quinlan (Walmart & Brookshires). 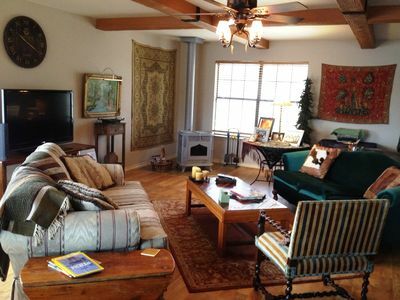 Quinlan and Royse city both have cute little town squares with some local shopping/antiquing. The town of Rockwall is only a 20 minute drive and has every restaurant/retail therapy you could need on your stay! Fishing is catch & release only unless permission given. When during a burn-ban, no fires in the pits allowed. Weekly & Monthly rates available upon request. Please be respectful to all furnishings, animals and land!